Replica tape consists of a layer of compressible foam affixed to an incompressible polyester substrate. Acquiring an impression of the surface. 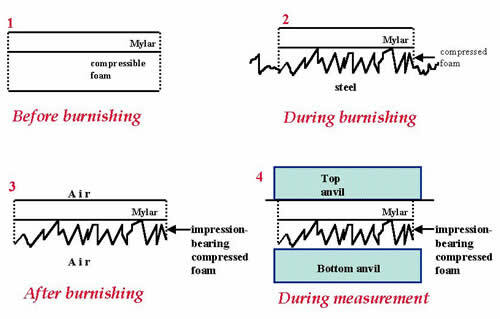 Placing the compressed tape between the anvils of a micrometric thickness gage, and subtracting the contribution of the incompressible substrate (50 micrometers or 0.002 inches), gives a measure of the surface profile.